Is your website any good? You’ve probably invested a lot of time and money into it, but how can you tell if it’s doing everything that it should be? There are plenty of quick online tests and checker tools that can give you an inkling of your website’s performance, but they don’t tell the whole story. 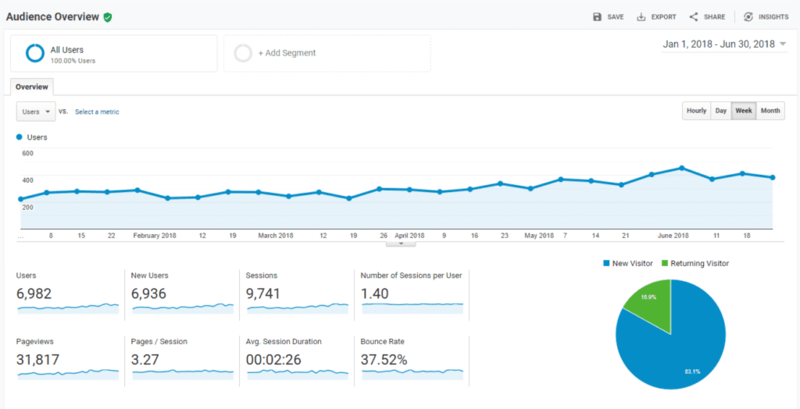 In order to truly understand how your website is doing, you need to learn how to dive deeper into your website analytics. In this chapter, we’ll cover the basics of how to do website analysis, how to understand what your analytics mean, and how you can use those insights to improve your website. The first step to measuring any of your marketing efforts is to start with your goals. The purpose of website analytics is to determine if and how your website is achieving those goals, so you know what’s working and what to improve. Without goals in mind, businesses can get stuck trying to measure everything. Even worse, they don’t know what to do with all their data and reports once they have them. Think back to when you planned your website. What was the purpose of your website? What did you want it to accomplish? For many businesses, the answer is something along the lines of “generate more leads.” (But of course, I hope you’re using more specific, SMART goals). The point is that if your goal is to generate more leads, your analysis should focus on answering questions like: Is my website converting visitors to leads? Which pages are most effective at driving conversions? Which traffic sources generate the most/best leads? You should not be worried about getting less traffic on your last blog post. Focus on analytics that help you gather more information about your specific goals. With your goals in mind, you can choose key performance indicators (KPIs) that align with your objectives. So again, if your goal is generating more website leads, your KPIs might be the number of conversions, conversion rates, and number of leads by source. Your objectives should always guide your metrics. That’s not to say that you won’t measure other things, too. There are plenty of important website metrics that can give you insight into why your website is performing poorly, or where it’s converting the best. But you should always prioritize metrics that give you actionable information on how to achieve your goal. Otherwise, you’re just measuring for the sake of measuring. Now that you know your goals, and you know which metrics and KPIs you need to measure, you can select tools that help you gather the right data. That in and of itself can be a huge challenge. The marketing technology landscape has exploded over the past few years, and there are 1000’s of web analytics tools out there, covering all aspects of measurement, from traffic analytics to web experience management to KPI dashboards, performance monitoring, SEO tools and much more. For most small businesses, using Google Analytics is a no-brainer. 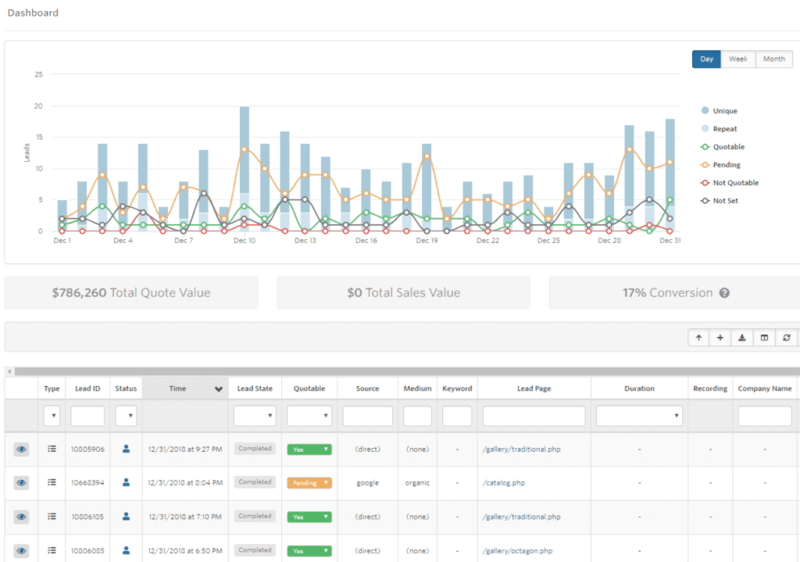 It’s robust platform that provides a great overview of your on-site performance, including traffic analytics, audience insights, behavioral data, and conversion information. The sheer volume of data you get from Google’s web analytics is second to none, and for the $0 price tag, there’s little reason not to have it. If your website goals revolve around driving more leads and sales, you may want to consider adding lead/call tracking software to your website. While Google Analytics can be used to track conversions like form fills or mobile users clicking on your phone number, the functionality is limited, and it can be complicated to set up. Additional tracking software can give you a user-friendly dashboard to track, review, and follow-up with inbound leads. Call tracking software also gives you the ability to record phone calls so you can refer back and improve your customer service. Session tracking and heatmap software is highly useful for evaluating your website’s users experience. Google Analytics is great at identifying how visitors get to your website and where they go, but it can’t show you the detail of what they did while they were there. 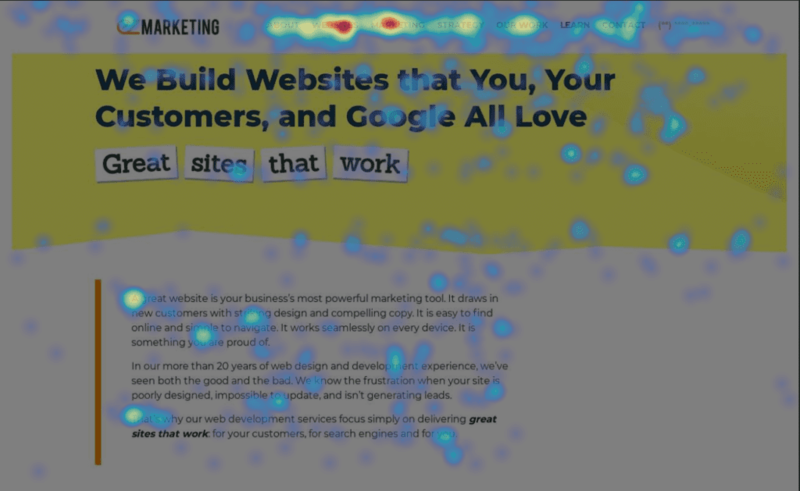 Session tracking and heatmap software like Hotjar can help fill in the gaps so you get a better picture of how exactly users are interacting with your site and optimize it more effectively. If you’re doing any kind of Search Engine Optimization, you’ll want to measure the impact of your efforts and make sure that your website is visible in search engine results. Google Analytics will tell you a lot about how users are interacting with your site, but it doesn’t tell you how search engines interact with your site. Google Search Console (a close cousin of Google Analytics) is a great tool to provide deeper insight on keyword performance and search engine visibility that can help you tell if your SEO is successful or not. And it’s free, so again, there’s very little reason not to use it. The problem is what is considered ‘good’ website traffic or a ‘good’ conversion rate varies widely by business and by industry. So how do you establish a good benchmark for your business? Because every industry, every business, and every research study is a little different, general statistics are probably the least accurate benchmark for your analytics. If you don’t have any other frame of reference, they can be a starting point, but be careful not to get too hung up on generalized numbers. Traffic: Widely depends, but if your traffic is less than 400-500 users per month, you may have trouble getting enough data for effective analysis. An alternative method for deciding if your website is “good” or not is to compare your current performance against past performance. If your website traffic increased by 200% year over year, that’s a strong indication that something you’re doing is working. Seeing how your website performs over time (and whether or not it meets your goals) is more useful information than comparing your performance against generalized statistics. Especially if your website is new, give yourself time to gather data and set a baseline for what’s realistic for your business. Then you can set meaningful, achievable goals for your website. Even if your website is performing great against your own personal benchmarks, you still need to keep an eye on your competitors. The trouble is, you don’t have access to your competitors’ web analytics, so figuring out what they’re doing takes a little more effort (and some software to help). Happily, in the age of technology and big data, there are a ton of tools out there that can help with competitive analysis and figuring out what your competitors are doing online. SEO-focused tools like SEMRush or Ahrefs can provide insight on how your competitors’ websites are performing in search results. Ultimately, a combination of all three methods is the best way to set realistic expectations for your website analysis. Not sure if your website is working? One of the biggest barriers to doing effective website analysis is understanding what all your analytics mean and translating that data into actionable insights. Next, let’s go over a few important questions you should be asking, key metrics that can help you find the answer, and how to use your data to make improvement to your website. Since Google Analytics is the go-to tool for most small businesses, we’ll primarily focus on those reports. If you’re like most business owners, you want to know how your website is impacting your bottom line. In order to do that, you need to track your website conversions – primarily form fills and phone calls. While it’s possible to set up conversion tracking in Google Analytics, the process can be cumbersome and technical. I’d highly recommend getting separate lead tracking software to help you track and follow up with individual leads. These types of software programs usually have an easy-to-use dashboard where you can see all of your website leads. If you are using Google Analytics, go to Conversions → Goals → Overview. Before this will work, you will need to set up Goals in your analytics account. If you have an e-commerce website, you can also set a $ value for web conversions. Regardless of what software you use, look for the number of conversions (form fills and/or phone calls) within a time frame, the conversion rate, and the sales value (if you set that up). Obviously, the more conversions and the higher the conversion rate, the better. Look at the pages on the site where the conversions are occurring, so you know which parts of your site are most effective at generating leads. You can also sort your results by traffic source, so you can compare which channels (organic, direct, social media, etc.) are more effective at generating leads. Everyone likes to see analytics charts with lines going up and to the right. But metrics like overall traffic or total number of page views are so broad that they rarely provide actionable insight. They’re vanity metrics. Dig deeper to figure out where your traffic is coming from. In Google Analytics, go to Acquisition → Channels. Look for top-performing channels – the ones that bring the most traffic to your website and generate engagement and conversions. Note if you have unusually high bounce rates or low conversion rates from a particular channel – this can be an indication that your website isn’t providing a good user experience for that type of user. Where are users spending time on my site? Knowing which pages your users spend time on lets you know what content they find valuable, and where you should focus your improvement efforts. It can also reveal areas where your content is weak, or you have a poor user experience that is causing users to leave your site. In Google Analytics, go to Behavior → Site Content → All Pages. You can also use separate session tracking and heatmap software to get more detail. This report shows you your most popular pages and key stats on how people engage with those pages. High average time on a page generally means it’s engaging and interesting to your website visitors. But keep an eye out for pages with a short time on page and a high bounce rate – that’s a sign that your customers are getting irritated or aren’t finding the information they’re looking for. Look for usually high exit rates too to find out where visitors are leaving your site. Sometimes a high exit rate is OK – like on a thank you page after someone fills out a form. But if you have a page that is supposed to be driving conversions, a high exit rate is a big red flag. So How Do I Tell if My Website is Any Good? Before you start measuring anything, make sure you know your goals. Even a website with a ton of traffic won’t do you any good if it’s not meeting your goal. Second, choose metrics that align with your goals and use analytics tools that help you measure those things. Focus on measuring things that help you take action, rather than trying to measure everything. Finally, make sure you understand your reports so you can analyze them, draw conclusions, and use that insight to improve your website. A good website is optimized and effective at achieving your goals. If your website isn’t generating the results you want, our team of web designers and developers are here to help!